If you've been involved in the naming process you’ll know it’s undoubtedly one of the hardest parts of branding. It's entirely possible to spend endless days looking through the thesaurus, scrutinising poems, gazing at clouds, listening to music, fiddling with inanimate objects and lying in the middle of the room without so much as a sign of inspiration. Although the process has been developed, re-developed, practiced and refined by many creative and brand strategists, everyone knows the challenge starts with knowing where to find inspiration. Once you’ve started generating ideas, sifting through the crumpled pieces of paper and stray post it notes, you end up with a shortlist of sort-of-almost-names. Some of which are based on your gut feeling and some that match a list of criteria (because I guess we have to be practical and realistic too). The next hurdle is selling your idea to people, explaining the multilayers of meaning which you've constructed and deconstructed. This wouldn't be so difficult were it not for the preconceived ideas everyone carries with them, shaped by their views and experiences. It’s like letting someone else name your child. An analogy that accurately captures the discomfort an organisation must feel when handing the name reins over to someone else. In Romeo and Juliet, Shakespeare makes it clear that regardless of what name you give a rose, its scent will remain the same. Powerful, but nonetheless a disheartening reminder after having gone through a creative maelstrom to land on a name which meets the brief and everyone agrees on. Shakespeare’s point can definitely be applied here. Your name is only the tip of the reputational iceberg and it's very rarely seen in isolation. What shapes people’s opinion of your brand is much more complex. It comes down to the bonds you create, the relationships you form, the personality you project, the appearance you take and the experience you offer. Start-ups and new organisations have it relatively easy, with no customer, supporter or staff perceptions to change. Organisations are faced with a much graver battle when they’re changing their name. A new name signals a shift. People expect change, in identity, appearance and values. There will be a change in internal culture, your views and tone of voice. 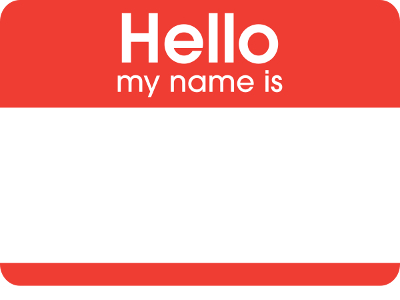 A name is redundant if your brand doesn't live up to its values, doesn't tell a unique and compelling story, and doesn't offer you the most engaging and rewarding experience. The time, money and energy you invest in creating the right name is only well spent if you invest the same level of commitment to walking the walk as you do to talking the talk. The name alone isn't the legacy of a great brand. Once you’ve settled on the right name, be sure to live up to it.